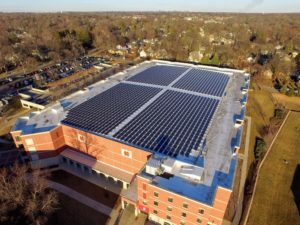 As announced in February, the North Central College project went live into the PJM wholesale market this month with excellent dispatch performance. In this picture you can see the battery container that has been craned to the roof structure and connected. This entry was posted in North Central. Bookmark the permalink.